Check out this link, watch the video! 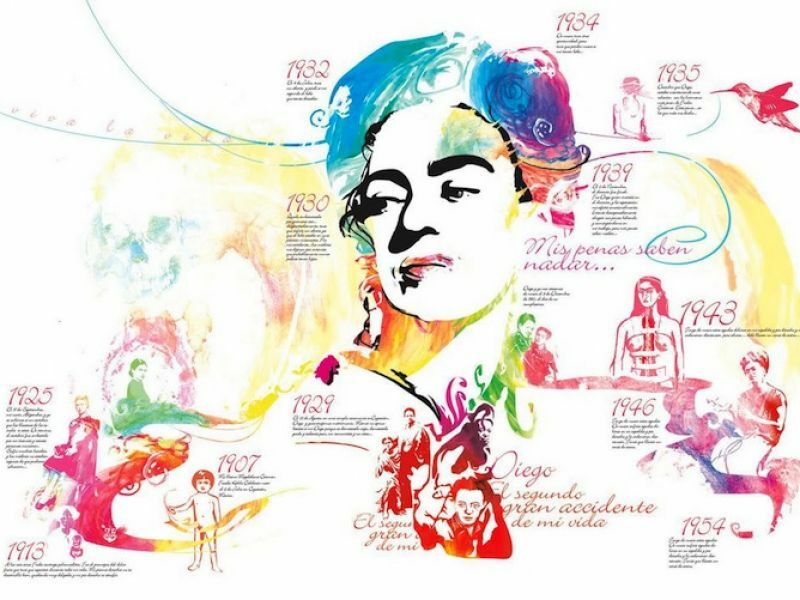 June 3rd, 2007 - Mexico City commemorates the 100th anniversary of Frida birth. The 100th birthday of Frida will be honoured with the largest-ever exhibit of her paintings by the Museum of the Fine Arts Palace in Mexico, named "Frida Kahlo, 1907-2007: homenaje nacional". "The 354 pieces will be the largest exposition of Frida Kahlo," director of the National Fine Arts Institute Teresa Franco told reporters. It will also be Kahlo's first comprehensive exhibit in Mexico, she said: After Mexico proclaimed Rivera paintings to be national cultural heritage, foreign owners feared lending her work to Mexico. Besides one-third of her artistic production, manuscripts and 50 letters that have not been displayed previously, she said. Works are on loan from Detroit, Miami, Los Angeles, San Francisco and Nayoga, Japan. "It is important for our visitors to know that Frida wrote, thought, challenged the Americans . . . here they will see the complete Frida," Bellas Artes Director Roxana Gonzalez said. The most recent international exhibition of Kahlo's work was in 2005 by the Tate Modern in London, which brought together 87 works. open 10:30 am to 6:30 pm Tuesday through Saturday. To mark the anniversary, the Blue House, Kahlo's Mexico City family home-turned-museum, will display nearly 300 pieces of clothing found more than two ago in a trunk in an unused bathroom. Celebrating Kahlo’s 100th birthday, the exhibition includes the museum’s prized possession, Kahlo’s Self-portrait Dedicated to Leon Trotsky, 23 photographs of Kahlo by various artists, 10 of Kahlo’s unpublished personal letters to family and friends from The Nelleke Nix and Marianne Huber Collection: The Frida Kahlo Papers and 12 never-before-seen photographs of Kahlo’s private bathroom at the Casa Azul. Among the photographs will be a new collection of images by Mexican photographer Graciela Iturbide of Kahlo’s private bathroom at the Casa Azul and its contents, which were sealed until fifty years after her death. The combination of these materials will provide a stimulating context for exploring the relationship between Frida’s colorful, mexicanista image and the difficult realities of her personal life. The Walker Art Center recently announced that it's teaming up with the San Francisco Museum of Modern Art to present "Frida Kahlo," a collection of Frida's paintings, to mark the centennial of her birth. The exhibit — curated by art historian Hayden Herrera and the Walker's Elizabeth Carpenter — will make its debut at the Walker on Oct. 27, running through Jan. 20, 2008, before moving on to the Philadelphia Museum of Art and the San Francisco Museum of Modern Art. The famous actress Ofelia Medina played the role of Frida Kahlo in Paul Leduc's major film, “Frida, Naturaleza Viva”. “Cada quien su Frida” is the most recent Ofelia Medina's creation in which she combines pieces of the unique Mexican painter diary, her letters and writings, with some scenes described in the Lolo de la Torrente's book “Memoria y Razón de Diego Rivera”, fused with the favourite songs of Frida Kahlo. Humour and irony, inherent signs to both artists, are possessed inside this oniric musical show. Ofelia Medina is a powerful actress. Because of that, she was the first one to represent the unusual Mexican painter Frida Kahlo at Paul Leduc's major film, “Frida, Naturaleza Viva”, and she is proudly the one who, at that time (1984), promoted the realization of this film that actually won several international awards. The company is integrated by talented young actresses that characterize different periods from the painter like Youth Frida, the one' who believes and is absolutely alive, represented by Teresa Ruiz. Dead Frida is ironic and with a sharp sense of humour, wonderfully characterized by Miriam Balderas. Besides them is the Tina Modotti's character, Italian, communist and photographer represented by Francesca Guillén as the younger Tina, and by Giovanna Cavasola as the older one. Both actresses have a huge formal career in performing arts. Dayana Tellerías represents the very close friend and Frida's nurse; Judith, the Cuban woman who was also absolutely compromised with communism as lots of intellectual people during that time. Ambiental live music is a collage between cello and percussion, especially composed for this play by Jimena Giménez Cacho, extraordinary cellist with an amazing sensibility and talent. Natalia Perez Turner, who is also a brilliant cellist, shares the Morfina's character with Gimenez Cacho stirring it with her own twist. We also include popular Mexican music directed and performed by Ángel Chacón in the companion of Mauricio Díaz “el Hueso” and Kátsika Mayoral. Together they recreate Frida's parties' atmosphere with a traditional and pleasant repertory from different authors of the time. Scenography is made up by Carmen Parra, Mexican scenographer and painter. Production is in charge of Begoña Lecumberri. 100 variations on Frida Kahlo's painting "The Two Fridas" by the German artist Renate Reichert was exhibited in Berlin in 2007,as a gift for Frida's centenary.From May 24th to July 8th at the Haus am Kleistpark. Race and Rhythm is a Performing Arts Company based in London. Their last piece, Frida, is a 20 mins piece that represents a collage of the life and work of the Mexican artist. The piece was showed at The Place Theatre having excellent audience feedback and reviews. As a celebration on Frida's Centenary the piece is going to be extended to a 70mins. The piece includes both original and traditional music, live singing, colorful costumes, and 10 international performers in a Contemporary work inspired by Frida Kahlo live and work and Flamenco, Classical Spanish, Argentinean Tango, Mexican Folk and Hip Hop dance movement vocabulary combined with projections and a simple but effective scenography. Both the 20mins piece or the 70 mins show will be available for touring from April to December 2007. Critically acclaimed, multiple award-winning solo show starring Allegra Fulton. First presented in Toronto, Canada, and after an international tour remounted at the National Arts Centre of Canada Jan 9- Jan 29th 2007 and continues to play in major theatres in both Canada and the US, as well as productions in theatres internationally. Celebration of Mexico, a multimedia musical fiesta, will close the Dallas classical concert season on April 28. Robert Xavier Rodriguez conducts a concert suite from his acclaimed chamber opera, Frida, based on the tempestuous life of painter Frida Kahlo. The concert will also include Copland's popular El Salon Mexico and music by Revueltas and others. Guest soprano Alba Quezada will join pianist Jeff Lankov and the Musica Nova ensemble. The University Theatre of Dallas University, Saturday, April 28, 2007, 8:00 p.m.
"Casa Blue: The Last Moments in the Life of Frida Kahlo"
"I hope the leaving is joyful - and I hope never to return"
Mexico’s most famous painter comes to life…and death. As the world marks the centennial of her birth, we celebrate the most famous painter to come from Mexico, Frida Kahlo. Victim of a tragic streetcar accident as a teenager, Frida was emblematic of the idea that out of pain can come positive energy. She championed the indigenous culture of her country in a style combining realism and surrealism, and her steamy romance (and two marriages) with painter Diego Rivera has been called one of the greatest, if not most unusual, love affairs of all time. Though physically fragile, Frida was a tough-talking woman who smoked and drank, and had affairs with men and women, including one with Russian revolutionary Leon Trotsky. She was a person who had a huge appetite for life, and her legacy and body of work remain sensual and alive, more popular now 50 years after her death. More info at Casa Blue website.